Basically, what the human eye cannot see; the Trichoscope will see. And what the human hands cannot measure; the Trichogram measures and exhibits the results, digitally. Trichoanalysis: A system of hair analysis to give the professional TR stylist a better understanding of the physical and microscopic properties of hair keratin. By using the Trichoanalysis Chart, the client can visually see the results of the structural stability of the hair; according to its diameter. And I’ll explain all that in detail during the consultation. 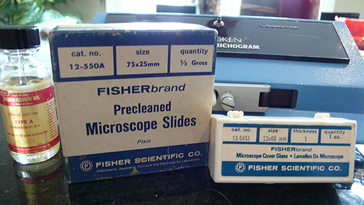 The Trichoscope is a specially constructed microscope that magnifies the hair up to 200 x (times). It produces plane polarized light for retardation color analysis of the competency and the shape of hair fibers. The Trichogram is a scientific tool that is used to help determine the hair’s structural competency specifically its strength and its elasticity. The typical evaluation from a Trichogram has two points of interest: the yield point and the break point. 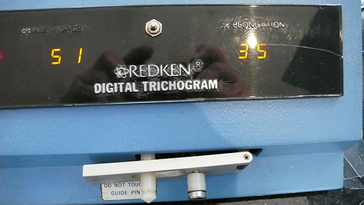 The Trichogram is an invaluable tool; it exhibits the strength and percent (%) elongation of hair and according to the hair’s diameter in microns. 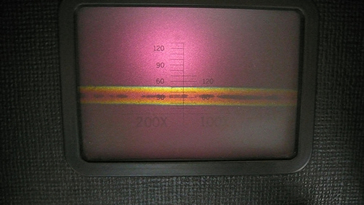 A typical curve from a Trichogram has basically two points of interest: yield point and break point. The alpha helical coils of the keratin can be stretched up to the yield point and will still return to their natural resting state like a spring which is pulled and then allowed to return to its original position. This yield point is the point at which the Grams in Force (the hair’s strength according to its diameter) is measured. It defines the resistance of the hair to deformation by force. This is, in effect, a measurement of the strength of the fiber. In the post yield region of the curve, the helical coils have been deformed and can no longer return to their original shape. This would be like pulling the spring beyond its capacity. The springs can no longer return to its original or natural state. Breakpoint is the point at which the helical coils have been pulled to their capacity and break apart. At this point, the hair has been stretched a certain percentage of its original length, and the measurement is called percent Elongation (elasticity) of the fiber and defines the pliability of the hair. All of this stress-strain information should also be used to help determine the risk of using TR, bleach/highlight or other potentially damaging reactive cosmetics on any given head of hair. The hair must exhibit a certain number in Grams in Force (strength) according to its diameter in microns and percent (%) Elongation, or elasticity to be considered as average or above average keratin structure. All of this stress-strain information is used to determine the risk of using permanent TR bleach/highlight or other potentially damaging reactive cosmetics on any given head of hair. Otherwise, if the hair exhibits below average keratin structure, then you shouldn't be getting a TR. You need to wait until your stylist can bring your hair to average keratin structure. The selection of hair samples is extremely important in the overall results of Trichoanalysis. Since all cosmetic treatments are based on the results of the analysis, the hair samples taken must be representative of the entire head of hair. Samples should never be taken from an area which will be cut or trimmed, no matter how damaged the hair may be. In such a case, I would be analyzing damage that no longer remains a problem to the overall condition of the client’s hair, thus receiving useless results. Keep in mind that we are selecting a "very small" group of hairs to represent a "very large" group of hairs, and for all results to be valid, the results I take "must" be representative. * Green center color shows above average keratin structure. * Blue center color shows a slightly above average structure. 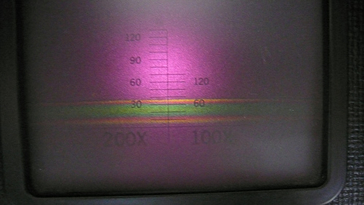 * Magenta shows an average structure. * And Yellow shows a below average keratin structure of the cortex. Typically, highly compact hair tends to show a higher order of retardation color. When lower order colors appear, this may be due to disordering of the structure which appears less compact. Also, the larger the diameter of the hair, the higher the order of color will appear. For example, in viewing a single hair shaft, when viewing through the thickest central part, it may appear green: but if viewed through a thinner section, it may appear blue, green, magenta or even yellow. If a yellow retardation center color appears in an otherwise homogeneous magenta, the hair keratin will break more readily at the yellow portion. A slight disordering in the hair structure can be remedied by topically applied cosmetic reconditioning treatments and maintained on a regular reconditioning schedule before a total structural breakdown occurs. Trichoanalysis is a system of hair analysis. It gives the professional Japanese and Brazilian Hair Straightening stylist a better understanding of the physical and microscopic properties of hair keratin. There are 3 Trichoanalysis evaluation charts, Caucasian, Oriental and Sub-Saharan Africa charts. 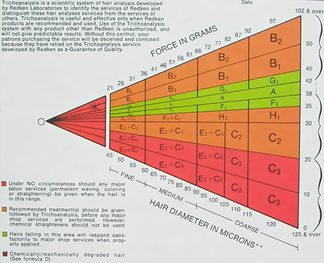 The Trichoanalysis Chart - It defines the strength of the hair in Grams in Force and its % Elongation. This is the test I run during the consultation using the Trichogram (a scientific tool that determines the structural strength, stability and the elasticity of the hair). The Trichogram results will exhibit to the TR/BKT stylist the structural stability of the hair. In Summary: Healthy hair requires an ideal balance between elasticity and tensile strength. Trichoanalysis is a Scientific Hair Analysis System to Study Hair.